Congratulations Evan Benoit, you are September's Shark Fan of the Month! Evan e-mailed us at sharkadina@gmail.com with a dope-as-sh**k story of coming face to face with one of the Shark's cousins. Read the story below, with our input [bracketed]. 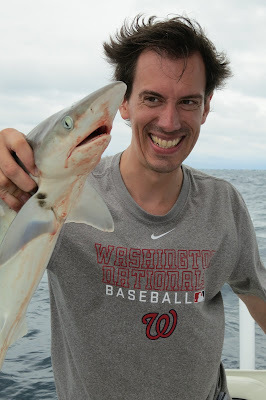 Using a Curly-W-shaped fishhook [brilliant idea, Evan], I caught one of Sharkadina's cousins off the coast of Emerald Isle, NC. He put up a great fight [as one would expect from a relative of the all powerful Shark], but I had to throw him back down to the minor league, so he could grow to his full size of 6'2''. Next time, I'm going to need a bigger boat." Evan learned of the Shark nickname when he sat in front of us a couple of months ago, and apparently spreads "the gospel of the Shark wherever [he] goes". If that doesn't earn a Shark Fan of the Month award, I don't know what does.